You can head for the nightlife of Patong, the energized vibe of Karon or for the seclusion in Mai Khao and Nai Yang in the north. But if you want just the right amount of all the best ingredient of each of these areas you book from our list of hotels in Kata Beach. It will jump start your honeymoon with romantic accommodation and the best views, it has the ingredients for an epic family holiday and our beachfront resorts here really do mean no road separates you from the sandy shore. The area has ample restaurants and bars at which to spend balmy evenings, but maintain a tranquil atmosphere and if you stay in Kata Noi you could expect a degree of exclusivity. 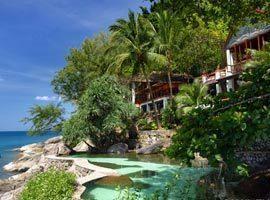 This intimate cove is separated from the main strip of sand by a rocky outcrop and is the most romantic location on the lower half of the west coast of Phuket. It features luxury 5 star hotels like Impiana Private Villas, romantic pool villas at The Shore at Katathani and Katathani Beach Resort is recommended if you are traveling with kids. However, with the colorful nightlife, more extensive shopping opportunities and teeming cosmopolitan streets of Patong only 10 to 15 minutes away you can be there in no time, but also quickly retreat to the tranquility of your home base. Karon is even closer and only 4 km away which means you can easily access multiple locations. 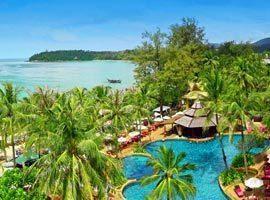 Since we are your gateway to the best hotel deals and with Kata Beach accommodation in high demand we suggest booking right away to avoid disappointment. Featuring a 242 sq.m private pool villa with a kitchen, a kids club and kids pool as well as the the ideal honeymoon accommodation in rooms with private balconies allowing direct pool access. Avista allows spectacular sunset views from its vantage point on the slopes of a verdant hill directly above the blue water of the Andaman Ocean. 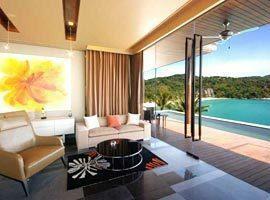 It offers rooms all with private balconies or terraces. Located in an intimate corner it offers beautifully decorated rooms with private balconies, beachfront villas, penthouses and suites with eye candy views. Many come with separate sitting areas. Centara is a trusted name in hospitality with the ideal mid-range family accommodation without compromising standards. 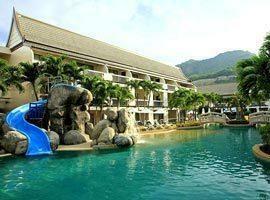 It offers family suites, a spa pool and pool with slide for the kids. 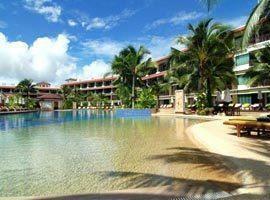 Luxury boutique resort featuring villas each with its own private infinity edge pool. 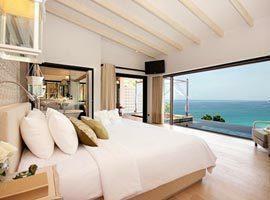 Villas are situated directly above the water's edge and feature glass front walls to guarantee unsurpassed ocean views. 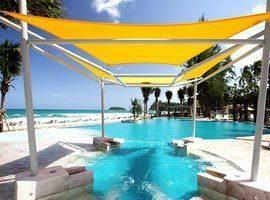 Allowing views of Crab island you can enjoy 2 oceanfront pools with pool bars. There is also a kids club and fitness centre. 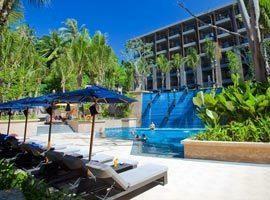 Choose from deluxe rooms with private balconies or direct pool access rooms. Located in a quiet corner amid a relaxed atmosphere Katathani offers no less than 6 oceanfront pools and 3 jacuzzis, a mini water slide, 3 kids pools, a kids club and entertainment program for children. Located on a headland just above the waterline and directly next to a cotton soft ribbon of sand Mom Tri's allow amazing ocean views. Rooms are offer extensive space and are masterfully decorated. 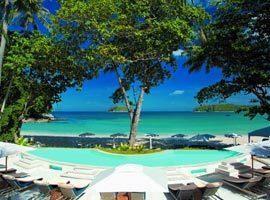 The best honeymoon hotel on Kata Noi. This hidden gem offers luxury private pool villas with stunning ocean views from private infinity edge pools and first class facilities in an intimate and romantic setting.